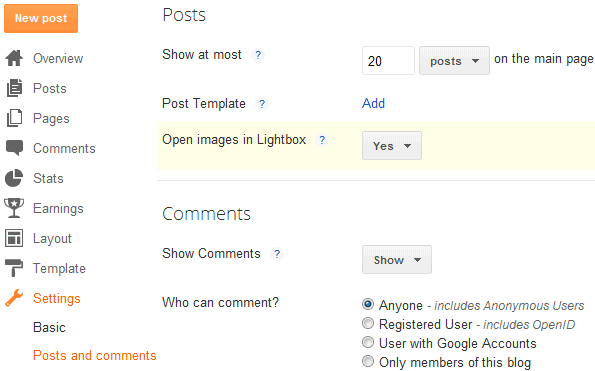 Last month, Blogger's team launched a Lightbox-like feature which was quickly removed after users started to complain. Blogger's Lightbox was automatically enabled for all the images from a post and blog owners couldn't disable it. The feature is now back, it's still enabled by default, but you can disable it from Settings > Formatting by selecting "No" next to "Open images in Lightbox". If you use Blogger's new interface, the setting can be found in the "Post and comments" section. As Google explains, "If Yes is selected, when a reader clicks on an image in a post, it will be displayed in a slideshow-like overlay instead of leaving your page and navigating to the image." Thanks for helping take me back to Blogger how I like it! I am changed to 'No' but still it is coming. Thank you so much! I couldn't figure out how to do this.